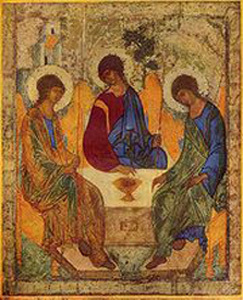 The Orthodox Church is an unbroken, worldwide, 2,000-year-old communion dedicated to living, preserving, and propagating the apostolic faith “once for all entrusted to the saints.” We believe in one God, the creator of all things, who reveals Himself at all times and in many ways to those who seek Him, and who ultimately revealed Himself by his Spirit in the person of his Son, Jesus the Christ, the promised King, who has united humanity and divinity in himself, by whom the whole world will be healed. As human beings, we are called to holiness, to a life dedicated to the One who called us into existence, to a manner of life consistent with the essential goodness of the Creator in whose image mankind was originally made. This full and meaningful life is found in the ongoing encounter with Christ our Creator in the life of the Church: in prayer and fasting; in repentance, confession, and reconciliation; in thanksgiving in the Eucharist; in the communion of the saints – in all the sacraments that make sacred. For we believe that as we encounter the image of God in one another, we live the life of love for which we were originally made; that as we work out our salvation in fear and trembling in the context of communion, it is thus that the Holy Spirit of God is at work in us to heal, restore, and make meaningful the life we have been given by God. Orthodox Christianity engages with, baptizes, and preserves the good in every culture to bring together the scattered people of God into one body that through the Body of Christ, the whole world might be made whole and made holy, united, and healed.